I hope you are having a lovely weak end! I understand there are exercises for that but as I always say, I can't see back there so it doesn't bother me that mine is fluffy ~ as long as it can hold me up for hours and hours of crafting! Really? A zebra pattern for a Christmas card? You'll see why in a minute. 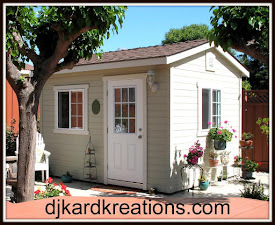 This is my week to be hostess of the Inspired By All the Little Things challenge. As hostess, I get to pick a talented card artist to introduce to you and she, in turn, will make you an inspiring work of art! For this challenge, I have chosen my friend, Colleen of One Smile Lifts A Spirit! For all the details on the rules and to see what Colleen and the amazing Design Team have created to inspire you, please click over to the challenge! We all hope you can join us this week!! There are LOTS of goodies in this photo to get your creative juices flowing! I think you can quickly spy that I was attracted to that awesome zebra chair and bright red pillow! I've had the zebra paper in my stash since the last century, waiting for this moment to shine! The MFT stitched star was cut from glittery foam paper. Pixie's Snippets Playground: AG using your snippets. 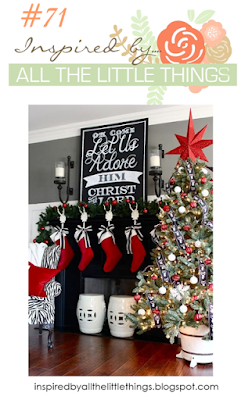 The Merry Christmas Challenge #41: Anything Goes. I loved the way my design used a lot of pp, so I made a few more. Some of the stars are cut from fun foam adhesive sheets which adds a puffy soft dimentia, like the card on the far right. You can find them online in many places. Here is a link to Mike's to see what I mean. The sheets also come glittered, like the star on the second card from the left. My twofer today was made specially for designer Dawn McVey. Here is a closeup of all the white glossiness. Many of you know Dawn from her beautifully designed Raspberry Suite line of stamps for Papertrey Ink. Dawn recently underwent a small intestine transplant. It is very rare. The surgery was a success, but she has a long recovery ahead of her. The ladies of Papertrey Ink are holding a one-week blog hop in honor of Dawn to send her our love and best wishes for a full recovery and to let her know she is in our thoughts and prayers. The only stipulation for joining in the hop is that you use one of Dawn's many incredible designs for your card. You can find Dawn's complete line of stamps here and find her works of art using them over on her Raspberry Suite blog. For my simple card, I used Dawn's Meadow Greens set. ETA: Oops, I just found out the Meadow Greens set was designed by Nicole. I will make another card for Dawn. Cardz 4 Galz: Favourite Flower and Why. If I'm honest, I don't care for dandelions in their flower stage, but when they mature and go to seed and form their fluffy perfect circles, I love them. Even as an adult, I will stop and pluck them when I can, blowing their seeds to the wind! I took this photo at our local park this past spring. You're a trooper if you made it to the end, especially this time of year when you are extra busy and I appreciate it very much! As always, thank you for coming by to visit the Playhouse and special thanks to you if you take the time to join as a follower! Please let me know you came by so I can be sure to return the flavor! LOVE! Need I really say more than that!? I love both. The stars grabbed me and held on. Looks like a CASE coming up for me. Wonderful cards! It took me awhile to figure out what pp meant. It finally dawned on me that it meant patterned paper. Whew! I pray that Dawn will have a great recovery. I actually just won one of her stamps so if I can get it together I'll enter in. Beautiful cards. I happen to think the zebra print paper is fabulous and so interesting on this card and I like it! The embossing on the other card is so pretty against the blue background and it's such a pretty image. All are such pretty cards! Fabulous zebra star card and like your variations of it! Your cstd for Dawn is stunning, like the embossing. As always you are so creative and different! :) This zebra card design is really outstanding! Love all the other patterns, too, but I'm in love with your twofer ... such wonderful, elegant and delicate design!! Amazing colors and gloss! Perfect design for making multiple cards, Darnell--love the big star & all the printed papers! Your card for Dawn is gorgeous--just my style! But, Meadow Greens is by Nichole. I know because I was thinking of using it, too, & have the box in front of me. What a beautiful card for Dawn! 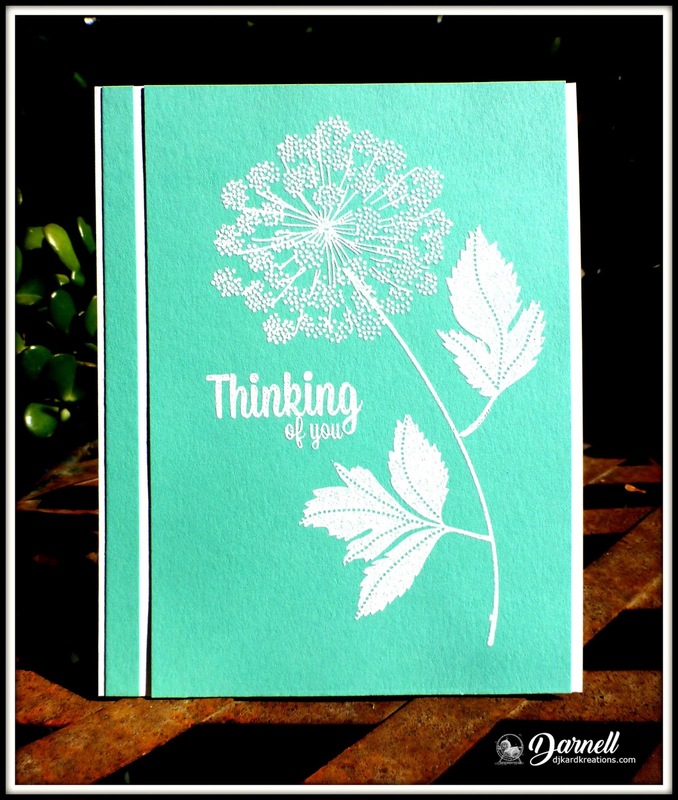 The simple white embossing with aqua looks gorgeous on her Meadow Greens flower! Love the way you used Meadow Greens! So pretty! lovely card! meadow greens is a beautiful set and you have used it so beautifully! Wouldn't you know you'd pick up on the one thing in the inspiration photo that most people wouldn't even notice, and it looks completely fabulous on your card with the glittery star! Bet you've got friends in South Africa this Christmas card would be perfect for. Love every single one of your starry Christmas cards. Good progress there! Your card for Dawn is absolutely beautiful with the glossy white EP on the minty-aqua card stock. Gosh, she's so young to go through something like that. You just never know. I love your bright and beautiful star cards Darnell, and what a great way to use up some of those super papers. The card you made frro Dawn is beautiful too, a fabulous stamp and gorgeous shimmery white embossing. WOW!Love those starry cards, especially the one with the zebra print. So vital and vibrant...gets your blood going. Actually, all of the ones you did are awesome. Way to use lots of patterned papers, for sure. Also, thanks for the heads up on Dawn McVey...I hadn't heard about her surgery but I'm glad to know it was successful. I'll have to check out my stash to see if I have any of her designs left. Beautiful cards! I love the star for using up pattern paper, Heaven knows I have a few tons of that here. The floral is lovely! Your cards are truly beautiful. Wonderful job. Cheers. Darnell, I, like several others did not even notice the zebra print chair in the photo. It makes a striking card! I also enjoyed seeing your other cards with the Christmas hoarded papers. I have a goal to use some of mine this season. One question, what is "puffy foam"? On your special card for Dawn, I am so impressed with your embossing skills! I figure Hammy must have been right beside you with his little Dust Buster to catch all those stray bits that can ruin a card when I try wet embossing. Nice work. I love the stunning simplicity of you card for Dawn. Gorgeous! 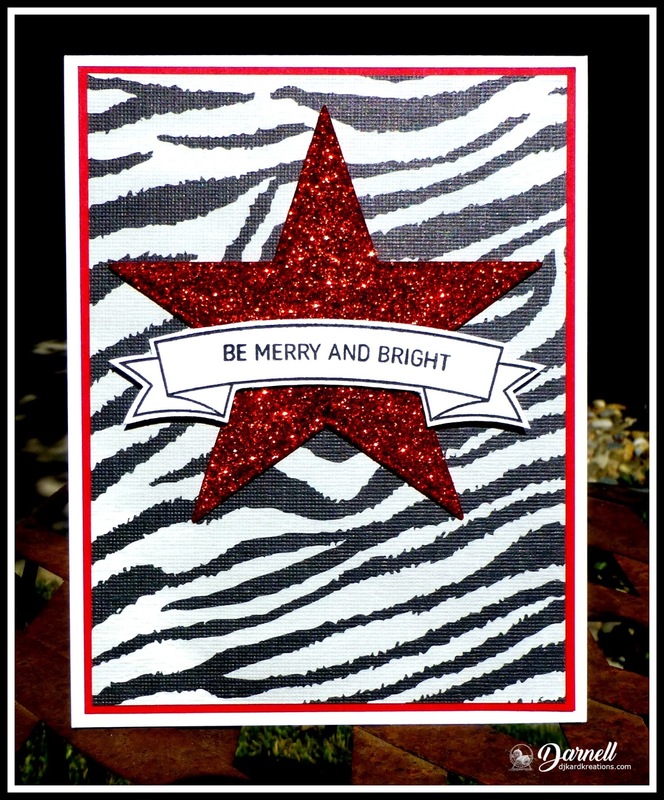 I love the zebra print and bright red, sparkly star combo! Thank you so much for joining in the Polkadoodles Anything Goes Challenge this time. Hope to see you again soon. Fantastic card for IBTLT, that star is the star. Great idea to make multiples. 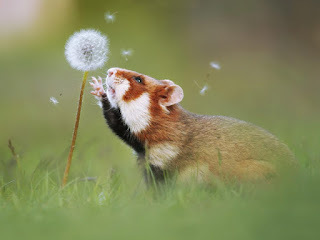 Your dandelion is fabulous, reminds me of carefree days of childhood. Gorgeous cards Darnell. Love your sparkly red star with the zebra stripe paper :). Great photo for inspiration. The meadow greens card is still very pretty! I am sure she will like it all the same! Well I am sure that Dawn will love the card either way! It is gorgeous! Love, love, love all your Christmas goodness. The zebra stripe is fabulous! A super set of brilliant creations, some stunning colours and great designs, especially love the card that you thought was for Dawn, beautiful image and love the gorgeous white stamping. Wow, wow, wow, red sparkly and zebra stripes, who would have thought - they look totally AMAZING together - very stylish... love it. 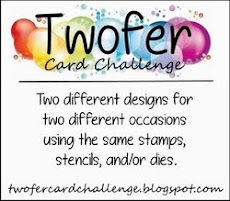 Your twofer is pretty amazing too, gorgeous background colour which makes the white stand out beautifully! You are a master card maker my friend!! Zebra background...no, I'd never think to do this, but Oh I DO like it very much with the glittering star. What imagination you do have and it's bold, striking and awesome to the nth degree. Very you! Also loved the soothing shades in the pretty dandelion card, and didn't know Dawn had surgery. I followed her, but haven't had a chance to visit in a while. Glad to hear the surgery was a success too. TFS & Big hugs. Happy wkend, and fall back! Super fun and wonderful cards. A great collection of Christmas cards. A gorgeous card for Dawn. why not zebras for Christmas :) Awesome card, love the black white and pop of red:). love the softness of the second and for such a good cause. Wow for the zebra Christmas, and it works! Outstanding design should be cased in many colors and patterns, and so you did... gorgeous cards. You are the funniest. I looked up Dawn's designs through PTI, and was shocked at how many she's done, and how many I have! Love them all. But of course, Meadow Greens is not among them. It's all the more beautiful and you won't see it (except yours) in the lineup. See? A silver lining! Great cards—especially the one for Dawn, love the CAS look, and the shine of the embossing! Beautiful cards!! I love them both! Your star card is perfect for mass producing for the holidays. I especially like those foamy, puffy stars. :) I do love your dandelion card, too. There's something about a white image embossed onto a solid background that is so classy looking. Animal prints and bling, what a sharp card! I love the soft turquoise with the white and what a beautiful stamp. Your festive cards will really stand out from the crowd and we love a bit of sparkle. Just shows we can use everything in our stash with the right inspiration! Hi Darnell, Did wonder why the Zebra print:) Fab card. The zebra print is a dazzling eye-catcher with that big glittery red star - I love the whole concept! Love your card for Dawn too, and my gosh - I have never heard of a surgery like hers, but I hope she gets well soon! I love the zebra print and the card design. It does make for a great mass producing design. Wonderful take on the on the inspiration photo, Darnell! I love how you incorporated the zebra print! And your card for Dawn is beautiful! Two fabulous cards Darnell. A great way of using up some papers as well . WOW gorgeous cards Darnell! I love your dandelion card and all of the shine! What a great flower choice... Thanks so much for joining us at Cardz 4 Galz! I love all the beautiful cards you made with that layout and also the last one as well. And, always I enjoy reading your posts. You make me smile every time. Darnell I love both your cards but the 2nd one is such a beautiful and special thinking of you card. I love the white embossing it sets such a feminine tone to the card and the simplicity of the design. Great CAS card. Best wishes to Dawn and for a speedy recovery. Thanks so much for sharing at the Watercooler Wednesday challenge this week. Lots of red schparkle on this zebra card! The background is a perfect match for the chair which I probably wouldn't have noticed! A great take on this inspiration photo! And I love the soft background with the white embossed flower. I have this set and I don't think I've ever used this stamp. You have inspired me to get it out...one of these days. what very super creations and your designs as usual are ace. You always make such amazing and very beautiful cards. OH so pretty pretty pretty! Dawn is going to LOVE this card! I mean who wouldn't want to receive a zebra card for Christmas, Darnell. I could sent it to my nail tech. She works at Le Zebra Zalon, where the decor is mainly zebra print but not overwhelmingly so. The design is so basic that it looks fabulous in all those other prints too. Your Meadow Greens card is lovely and it's one of my favorite PTI sets. Too bad you can't use it for Dawn and I'm glad you said you had to use one of her designs before I made my card. Your glittery star Christmas card is a great design Perfect for multiples. I am doing batch baking now too as it is getting so close to the overseas deadline and I am not ready! Yikes!!! Your second card is beautiful. 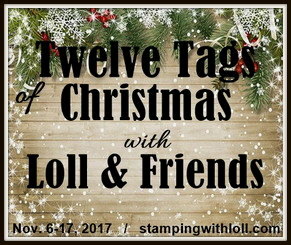 I do not have any of her stamps but think the blog hop will be a great honour and she will enjoy to read about it later. I used my gift card yesterday/ I know I said I would wait for the 12 Days |Of Xmas but I forgot about the Xmas Open House where everything in the store is 25% off and many. many items are at half off. I used my gift card and got so much for it! Lucky me. Thanks again Darnell, I have loved using my NBUS this year. Wow, Darnell, what lovely cards! I must admit my eye first went to the zebra background Christmas card. Well, it was first in line, so of course I saw it first, but wow, did it make an impact. I had to read more and definitely see where the inspiration came from. But on to the card which you made for our challenge. Gorgeous---definitely feminine. And so striking! Love that wonderful blue. It is absolutely perfect as a background for the glossy white images from the Meadow Greens set. 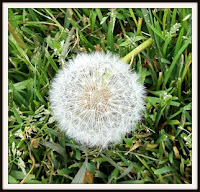 Dandelions are magical when they get to that seed stage and I think you caught some of that magic with your creation. Thanks so much for joining our Watercooler Wednesday Challenge this week. and what a wowzer twofer it is! That sparkly star looks like it needs to get up and do a kick line across a stage. Awesome! The floral is just magnificent. A fine design to use a lot of paper! But my favorite is the 2nd card; love the coloursheme and the flowers! Have a colourfull good week! Hi Darnell! I can see why you used a zebra pattern... and it looks perfect for a red, black and white Christmas! Love the inspiration photo, too. You made the most wonderful array of starry cards! The green padded background with red star is stunning! Fabulous cards Darnell and the zebra print is utterly stunning with the sparkly star! Wonderful to see you in the Playground again my leetle friend! Parsnip is quite overcome - I think he has a crush on you! So pretty! Such a beautiful shade of blue to accent the pure white images. Thanks for joining us at Watercooler Wednesday. Your glittery star card and variations are really eye-catching! Love the different looks you get using different backgrounds and papers for the stars! Tried to pin it but it wouldn't work. Have noticed that on my blog and others that all of the sudden the pin button doesn't work any more. Do you know what's going on? Your card for Dawn is very pretty and serene! Both cards are awesome. I would never have thought to utilize a zebra design in the manner you did. Now only you could come up with a Zebra card!! my fav is the green one that looks like quilting with cherries. Hugs Mrs A.
Oh how wonderful are your Merry & Bright cards! Love the zebra stripe and all of those fabulous patterned Papers, Darnell. I think your card for Dawn is gorgeous! 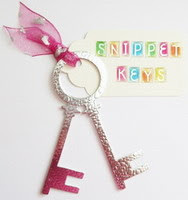 LOVE the colors and the stamp set~I am sure it will bring a smile to her sweet face! What beautiful cards! Actually I love them all! Thanks so much for joining us this week at Watercooler Wednesday! Two gorgeous cards. I love the beautiful bold red glittery star. It makes such a statement. The card for Dawn in contrast is so very soft and gentle, just perfect for such a card. Wow that star design of yours truly packs a punch, zebra or not. And what a way to use up PP too. Double win! Crazy news about Dawn. Hope she makes a great recovery. I love your dandy lion. Gorgeous cards!! Love the star card with all the red shine, so pretty! And, your card for Dawn is CAS perfect in the lovely aqua! Dawn will love it!! Dear Darnell, I'm a little late with my visit, because I was on holiday for a whole week. :-) I'm admiring your cards with the star. Wonderful design and a great opportunity to use christmas papers. I like the simplicity on your second card. Great desig for a background. Perfect! TFS Love and well wishes for Dawn and your gorgeous card even if Dawn did not design that dandelion flower. Our daughter's 4-H Hereford was named Weed Eater because she ate all the dandelions. The leaves are edible you know...Thank you Darnell for sharing the blog hop info too. Hugs. Beautiful cards Darnell! Love the sparkly star and the pretty embossed blossom! Surely Dawn will love it! Leave it to Irma to make a rag-a-muffin dandelion look like the belle of the ball. Such a gorgeous schparkly card. ;) Love that animal print too!! As always, Brilliant card making! Who doesn't love Schparkly combined with a little animal print?!?!?! Such a festive card, I loved seeing all the inspiration on this challenge. Only you can get away with a zebra print Christmas card lol! Love the delicate thinking of you card. Hope your friend has a smooth recovery.